It is my great pleasure to warmly welcome you all to our great country, Kenya, the cradle of mankind, and to the 2nd Hellenic Multi-Sector Investment & Trade Mission. 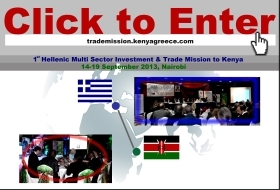 Following the success of the 1st Hellenic Investment & Trade Mission to Kenya, it is my hope that this 2nd Mission will even be better. I strongly believe that the interactions and exchange of information on investments and business opportunities during this Mission will be of mutual benefit and will further enhance the economic relationship between our two countries. It is imperative to note that Kenya is an excellent place to invest and do business in. It is characterized by a long period of political stability and democratic governance system, strong macroeconomic stability and outlook, continuously improving business environment, a long and unwavering track record of strong government support to enterprise and private sector, a rapidly growing middle class, abundant natural resources, good and continuously improving infrastructure, a great strategic location from where business people can reach all part of the continent and the world within a relatively short time, the best human skills in the continent, excellent tourism products and facilities, and unmatched hospitality and warm of its people. Kenya has maintained a strong growth momentum. The economy grew by 4.7% in 2013, and is expected to grow by about 5.8% in 2014 and to reach and maintain double-digit rates within a few years. This is not an unrealistic target considering that the country attained a rate of 7% recently, in 2007. Kenya is the economic, financial and logistics Hub and is the gateway to markets in the East Africa Community (EAC) and Common Market for Eastern and Southern Africa (COMESA), a region with 400 million people and whose per capita income is rapidly growing. The country is, indeed, also the gateway into Africa. 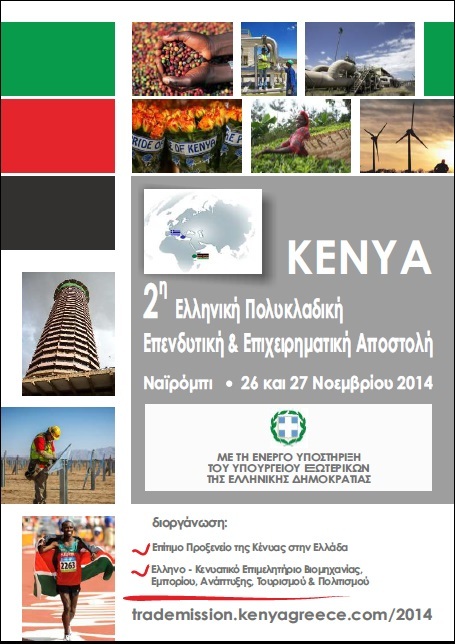 The country presents numerous and unique investment opportunities in various sectors, including Tourism, Agriculture, Wholesale and Retail Trade, Manufacturing, Information Communication and Technology (ICT)/Business Process Outsourcing (BPO), Financial services, Transport, Construction and Infrastructure, Mining, and Energy, among many other areas. We can assure you that, whichever sector you operate in, you will find accommodation in our thriving economy. Kenya is not just a great investment destination; it is also a top tourist destination complete with a wonder of the world and several globally recognized heritage sites, a source of high quality export products some of which (such as tea, coffee and horticultural products) have conquered global markets, and an exceptional place to live and work. As I conclude and on behalf of the Government of Kenya, we at KenInvest once again welcome all of you to our country and invite you to seriously consider the exciting business opportunities in the country. Kenya Investment Authority (KenInvest), a public agency with the mandate of promoting investments in all sectors of the economy, is proud to be a key partner of the Honorary Consulate of the Republic of Kenya in the Hellenic Republic. THANK YOU ALL AND KARIBUNI KENYA!